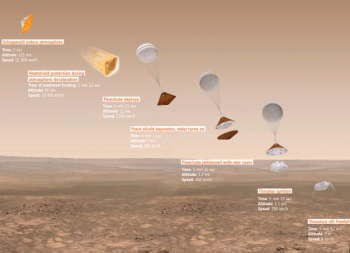 While the final result was not as intended, data from the European Space Agency’s Schiaparelli lander, which failed to make a successful soft landing on the surface of Mars last week, will live on in the form of the ExoMars 2020 rover, which will use data from Schiaparelli to upgrade and enhance its landing technology for a successful arrival at Mars in four years’ time. While some will certainly doubt the truthfulness of the claim, the fact that Schiaparelli did not make a successful, soft landing on the surface of Mars is in no way a failure to meet the objectives of its mission. 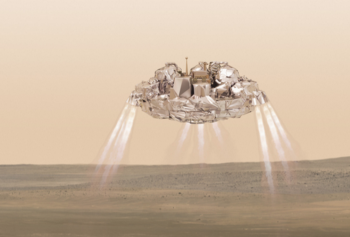 In fact, Schiaparelli’s main objective was to serve as a landing demonstration tool – a platform upon which ESA and Roscosmos could test their proposed landing technology for the ExoMars 2020 rover. To this end, Schiaparelli was a way to test landing technology for the 2020 campaign with enough time to make adjustments based on the data Schiaparelli returned during its landing attempt. And Schiaparelli did just that – transmitting its live data not only directly back to Earth through the Giant Metrewave Radio Telescope (GMRT) – an experimental communications link which seems to have worked beyond expectations – while at the same time transmitting its data to the Mars Express spacecraft already in orbit of Mars and its parent Trace Gas Orbiter (TGO) spacecraft, which was performing its orbit insertion burn around Mars at the time of Schiaparelli’s landing. While teams are still analyzing the data returned from Schiaparelli, what is known at this point is that the lander impacted the Martian surface at near terminal velocity after a failure in the final sequence of Entry, Descent, and Landing (EDL). In fact, NASA’s Mars Reconnaissance Orbiter (MRO) has played a crucial role in the initial stages of the investigation. 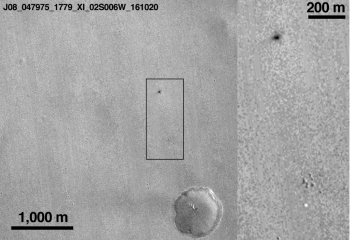 MRO passed over Schiaparelli’s planned landing site on 20 October, taking a series of photographs – which when compared to images obtained before the landing attempt clearly show what appear to be a parachute on the surface of Mars and a black impact crater where Schiaparelli is believed to have impacted the surface. Specifically, the features imaged by MRO are located at 353.79° East, 2.07° South, with the dark mark (impact point) approximately 5.4 km west of Schiaparelli’s intended landing point – well within the nominal 100 x 15 km landing ellipse. In a press release detailing the imagery findings from MRO, ESA stated that “Estimates are that Schiaparelli dropped from a height of between 2 and 4 kilometres, therefore impacting at a considerable speed, greater than 300 km/h. “The relatively large size of the feature [in the MRO image] would then arise from disturbed surface material. The images were taken with the low-resolution CTX camera onboard MRO, and NASA plans to take follow-up, high-resolution photographs with MRO’s HiRISE camera in the coming days. ESA hopes that the pending HiRISE images will help discern what the low resolution images cannot – including the location of the forward heat shield, which was jettisoned at a higher altitude than where the failure point occurred. 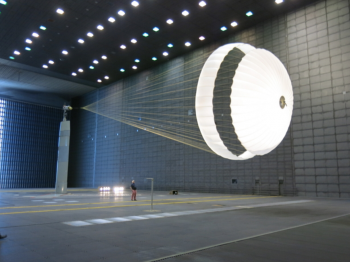 Identifying all of the constituent components of Schiaparelli – its forward heat shield, rear heat shield, parachute, and the lander itself – will help engineers better reconstruct the data and events of EDL. Nevertheless, what the data that has been analyzed so far confirms is that Schiaparelli completed most of its EDL steps – including deceleration through the atmosphere, parachute deployment, and heat shield deployment. While the signals returned through GMRT and from Mars Express and TGO all show contact being lost with the lander shortly before its expected touchdown time, ESA has stated that there are discrepancies in the data returned through GMRT from that recorded by the two orbiters. According to ESA, “The data have been partially analysed and confirm that the entry and descent stages occurred as expected, with events diverging from what was expected after the ejection of the back heat shield and parachute. After this apparent early ejection of the rear heat shield and parachute, Schiaparelli’s thrusters are confirmed to have briefly fired for 3-5 seconds before ceasing operations while the lander was still 2-4 km above the surface. 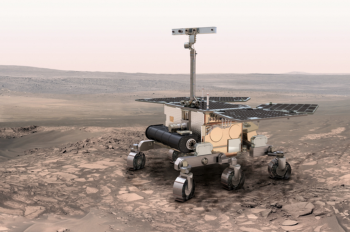 While mission engineers for the ExoMars 2020 rover will examine changes needed to the EDL sequence based on data returned from Schiaparelli, the rover itself remains on track for a launch in July 2020 aboard a Russian Proton-M rocket from the Baikonur Cosmodrome in Kazakhstan. The rover, which is yet to be named, will be a six-wheeled, autonomous terrain vehicle designed to carry an exobiology laboratory suite known as the Pasteur Analytic Laboratory. 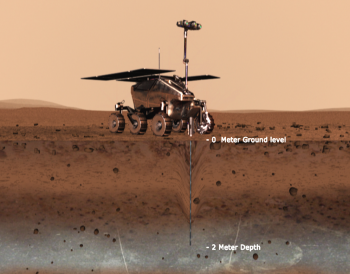 Overall, the rover will be tasked with looking for signs of biomolecules and biosignatures from past or present life. After initially conceived of as part of the NASA-ESA Mars Exploration Joint Initiative, the ExoMars 2020 rover was subsequently scaled back from its 295 kg (650 lbs) design when NASA pulled out of the project in 2012. Now weighing approximately 207 kg (456 lbs), the rover is currently under construction by lead contractor Airbus Defence and Space via their British division. 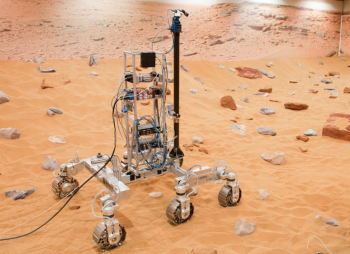 Procurement of critical parts for the rover began by Airbus in March 2014, with formal funding approval granted by ESA member states in December of that year. Budgetary constraints and problems caused by NASA’s departure from the joint initiative then resulted in a delay of the launch from 2018 to 2020. 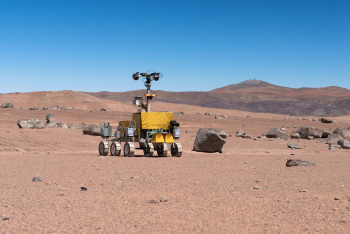 As part of a cost- and data-sharing plan for the rover, ESA reached out to other space agencies for contributions to the lander, resulting in the Canadian Space Agency, through their MDA manufacturer, building the wheels and suspension system for the rover. Under the current plan, Roscosmos will provide the launch vehicle as well as a stationary service platform that will deliver the rover to the Martian surface. ESA – with some Roscosmos assistance – will provide the carrier/cruise vehicle and EDL elements for the lander and stationary service platform. The rover itself will be solar-powered, capable of operating for at least 218 sols, or approximately six months, while using the TGO spacecraft as a data relay. To accomplish all of its scientific objectives, the rover is designed to drive 70 m (230 ft) per sol, with an overall lifetime operational design of a 4 km (2.5 mile) range over seven months. As with the other Martian rovers, ExoMars 2020 will be capable of autonomous driving via two stereo cameras that will allow the rover’s onboard computers to build 3D maps of the terrain in its immediate surroundings. While the rover’s range and ability to navigate its surroundings is important in terms of accomplishing the scientific objectives of the mission, most importantly is the science instruments the rover will carry with it. Like all landers, the rover will have a panoramic camera system specifically designed for this mission to provide digital terrain mapping and morphological signature detection capabilities of past biological activity around the rover’s immediate vicinity. Impressively, the rover will also carry a core drill, capable of reaching a maximum soil depth of 2 m (6 ft 7 inches) with a further ability to acquire core samples that are 1 cm (0.4 inches) in diameter by 3 cm (1.2 inches) in length. The drill will also be able to deliver the core samples to an inlet port on the Rover Payload Module, where the samples can be distributed, processed, and analyzed. Moreover, the largest suite of instruments onboard the rover will be its Pasteur Instrument Suite, including the Mars Organic Molecule Analyzer (MOMA), the Infrared Imaging spectrometer (MicrOmega-IR), and the Raman spectrometer (Raman). MOMA is designed to perform a broad-range, high sensitivity examination of collected samples for organic molecules via two extracting organics operations: laser desorption (forming ions without breaking chemical bonds) and thermal volatilisation with subsequent separation by four GC-MS (Gas Chromatography-Mass Spectrometry) columns. 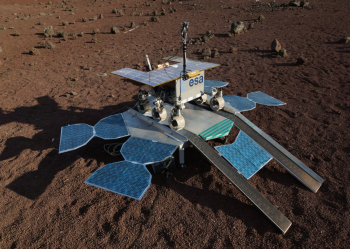 Conversely, MicrOmega-IR is designed to study the powder created from crushing drilled samples from the immediate Martian subterranean environment to help better reveal Martian geologic origin, structure, and composition. Finally, Raman will examine the collected geological and mineralogical samples to help identify organic compounds and search for life by identifying mineral products and indicators of biologic activities created through interaction with water. The rover will also carry a ground-penetrating radar to search for water and ice subsurface deposits, the Mars Multispectral Imager for Subsurface Studies (located on the drill to examine the boreholes created by the drill for water-related minerals and characterize the geophysical environment of each drill site), and the Close-Up Imager to visually study rock targets at 50 cm (20 in) with sub-millimeter resolution. Roscosmos will additionally contribute four instruments to the rover: the Infrared Spectrometer for ExoMars (mineralogy characterization and remote water-related mineral detection), the ANDRON-RM neutron spectrometer (subsurface hydration study), a Fourier spectrometer (temperature and aerosol measurements), and Radioisotope Heater Units. 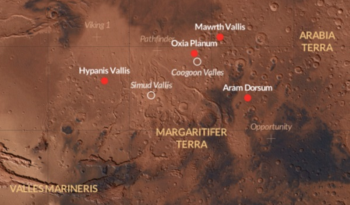 At this time, three potential landing locations are under consideration: Oxia Planum, Aram Dorsum, and Mawrth Vallis – with Oxia Planum currently the preferred landing site.